(St. Petersburg) After a full morning of public comment from a standing room only gathering, the Pinellas Suncoast Transportation Authority (PSTA) Board of Directors voted unanimously Wednesday to recommend to the Board of County Commissioners that Pinellas County move forward with a 2014 public referendum to fund a significantly expanded transportation system. • light rail connecting downtown Clearwater to downtown St. Petersburg, with a path through the Gateway area that can easily connect across Tampa Bay to Westshore, Tampa International Airport & downtown Tampa. • buses that run much more frequently, taking riders wherever they’re going faster, eliminating the need to consult bus schedules as buses will run as often as every 15 minutes on popular routes. • bike lanes & sidewalks that will make streets safer throughout Pinellas for everyone, including our kids. In a recent poll by the Tampa Bay Times, 60% of Pinellas residents said they supported public financing for light rail compared to just 33% against. Today’s huge turnout of proponents vs. opponents of a comprehensive transportation system was consistent with the findings of the Times' poll. The themes of freedom, choice, options, and democracy were heard throughout the remarks of dozens of speakers, representing a diverse cross section of the county. From concerned citizens to Chamber of Commerce leaders to environmentalists, a community consensus emerged that our most pressing need is to invest in a comprehensive transportation system that will grow our economy, reduce consumer expense, relieve congestion and clean up Florida’s smoggiest air. All of these goals can be achieved by providing residents and visitors with the full range of choices that most Americans already enjoy in metro areas the size of Pinellas County. Sierra Club’s Regional Representative Phil Compton was the last of 38 supporters of transit to speak, telling the board “We appreciate the dozens who spoke today, as well as the dozens more who didn’t but still made their support clear to the board by wearing a sticker that told PSTA to ‘Try Transit’. It’s time to finally remove this enormous barrier to our county’s economic growth and quality of life as we move beyond our dependence on oil while cleaning up our unhealthy air”. Sierra Club is America’s largest and most effective grassroots environmental organization. Washington, D.C. -- Today Barack Obama was publicly sworn into office as President of the United States. Join us in Tampa on January 17! and to clean up the slime. Last November, the U.S. Environmental Protection Agency adopted strong standards to combat sewage, manure, and fertilizer pollution in our waterways. What first sounded like a big victory could turn into a crippling defeat for our water and our way of life. You can make sure that doesn't happen, and that the EPA does not cave to polluter pressure. Join us in Tampa on January 17 to tell the EPA that we demand environmental protection! 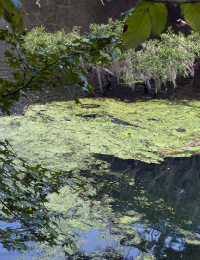 The EPA has announced it is handing over protection of 15% of Florida's waterways to the state's Department of Environmental Protection (DEP). The DEP's rules are far less strict, and enforcement has been left to friends of big polluters rather than environmental professionals1. It's no joke that people say DEP stands for "Don't Expect Protection." What's worse: the EPA is considering handing over the rest of Florida's water to the DEP. This would be a huge setback to all of us working to protect our water from toxic pollution and the telltale slime that comes with it. You can make sure the EPA stands strong by joining us for this critical event. WHEN: Thursday, January 17 from 11:30 a.m. to 1 p.m.
RSVP today and show the EPA that you demand protection for our water. The EPA is holding a public information session in Tampa and we plan on being there to make crystal clear (think Silver Springs before it was choked with algae) that Floridians will not let the EPA weasel out of its own strong rules to protect our water resources. After the press conference, we will march across the street to the Tampa Hotel where the EPA is holding the public information session from 1 p.m. to 7 p.m. We will then participate in the session by bringing photos, slime stories and comments to the EPA. Join us in Tampa and tell the EPA to enforce a strong pollution standard to protect all of Florida's water. This is the worst possible time to put DEP in charge of enforcing the Clean Water Act. The EPA must do its job and uphold strong protections for Floridians. The threat to public health from this green slime and polluted drinking water needs to be addressed aggressively and right away. P.S. The more people who attend this event, the stronger our message. Can you share this invitation with five people today?